A Q & A panel containing representatives from the QIF Community, authors, implementers, users, and thought leaders. Panel will also discuss the scope and uses for the new ANSI/DMSC QIF v3.0 standard and status on progressing QIF as an ISO/QIF. Furthermore, discuss the development and adoption of QIF from vendors and large industrial end users. ABSTRACT. The pressure to cut costs is high… and so we see original equipment manufacturers (OEM) assigning 75% or more of their final product to suppliers for manufacturing. 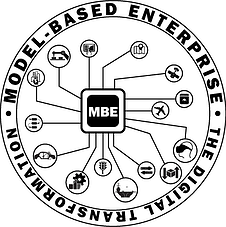 This is a major driver of Model Based Enterprise – and a significant challenge. How can the digital thread created by the OEM for its final product be stretched throughout the supply chain and woven back together without breaking? I.e., product requirements transmitted downstream, inspection results returned upstream, and the digital thread maintained throughout the supply chain… all in machine-readable form. To compound this challenge, OEM policies can pressure suppliers to support multiple CAD systems. The added expertise and expense required can overburden suppliers and drives up their costs. This workflow shows how many leading OEMs are overcoming this challenge. It demonstrates a reference MBE implementation with software from Capvidia, Origin International, and Net-Inspect.